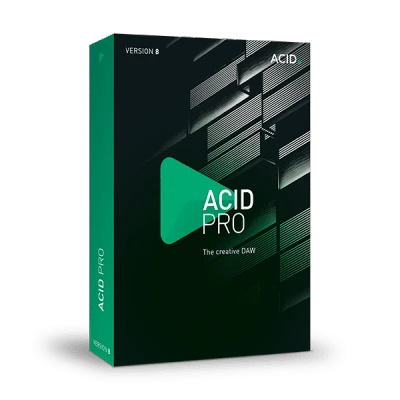 ACID Pro combines looping functionality with powerful DAW features for a seamless studio production environment. Typical ACID. The 30-day free trial version is the ideal support from your initial idea to the final master. It gives you the freedom to edit your music, mix your songs and finally to publish everything for free. Download the trial version now for free and get started. ACID Pro 8 makes it very easy to create entire song arrangements in no time at all. It offers many creative tools for today's producers that can be accessed from the main Arranger area. It's easy to divide your project into logical sections and then order them on the timeline. Tracks can be easily organized by placing them into Track Folders and then use cluster editing to drag, pitch-shift, cut, copy and paste whole sections of an arrangement to complete your tunes with ease. ACID Pro 8 offers an incredibly flexible recording environment with a dedicated feature-rich mixer. It's easy to assign plug-in effects or work with external effects and devices. There are also an array of routing options like recording external audio utilizing ACID Pro 8's effects. You can also create complex submixes with bus-to-bus routing and monitor everything in real time. ACID Pro 8 also handles surround mixing projects with a surround panner for precise control over channel positions. Within the Plug-in Manager, you can organize all of your DirectX and VST plug-ins – effects and instruments – and ReWire devices. You can assign effects to tracks and busses, synths, instruments, soft synth busses and rename and reorganize plug-ins. ACID Pro 8 also offers several ways to view plug-ins within folders or within the Mixing Console and even lets you categorize instruments so you can target exactly the ones you need for speed and flexibility. Produce, cut and edit music for free. Fill your mix with recorded hardware synthesizers, external sources or VST effects. You don't have to limit yourself to just analog effects – virtual instruments can be easily embedded as well. 5.1 mixes are also no problem for the free trial version from ACID Pro, just as sub-mix creation. Write MIDI files directly to the timeline with inline editing. Program beats with the Drum Editor VST support fills out the free ACID Pro trial version. This is how making music gets better. Don't just edit songs, remix them. The beatmapper comes to the rescue when you've got to add important beat information. Adjust sound clips easily to each other. Change your project's beat. With ACID Pro, you can prepare your track for remixing even directly during the production. The famous zplane élastique algorithm. World leader in pitchshifting. No matter how much you expand and distort your tracks – enjoy artifact-free editing with zplane and ACID Pro. Touch and Latch are new modes, which help you easily record automations during playback. All temporal imprecisions can be corrected using keyframes at the end. Don't worry about the how and where – use your mouse or an external MIDI controller for your keyframes and record automations in Stereo or in 5.1 Surround. Disc at once and Track at once burn processes. This isn't a problem for ACID Pro, whether you're using a trial version or the full version. You can simply activate it with the serial number after the purchase. Gracenote MusicID shows key information including, title, artist, and song name, and also submit data. Just what your tracks have been missing till now. ACID processes and saves the latest common file formats for your devices. Supported formats include MP3, WMA, WMV, AAC, FLAC, Dolby Digital AC-3 (for surround). No one home to celebrate your track? Simply upload your song to ACIDplanet.com. Listen to other productions. Take part in a remix contest or start a collaboration with one of the other members. Download the trial version now for free and use it for 30 days. If you decide to keep working with the full version of a program, you can buy and then activate it with the serial number. The activated full version can be used in complete range of features with no limits.